When Van Halen released their 1986 hit song “Best of Both Worlds”, I highly doubt they had fly fishing in mind. That’s unfortunate because my favorite fly fishing rig, the “hopper-dropper”, gives me exactly what they’re talking about in their song. It allows me to catch Northeast Iowa trout in the two worlds that their feeding habits exist. 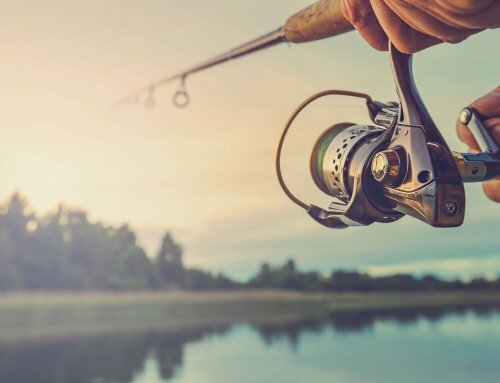 Two of the most effective methods for catching trout on the fly are dry fly fishing on the surface of the water and nymph fishing below the surface of the water. Each technique has its own merits and its own limitations. Combining these two techniques, as the hopper-dropper rig does, overcomes many of these limitations and combines all the positives of each. When trout are feeding on the surface they are typically eating hatching mayfly (called a “dun”), caddis fly, or mayfly that fall to the surface after mating to die (called a “spinner”) or any of a number of “terrestrials” such as ants, beetles, grasshoppers, crickets, inchworms and earthworms. A trout’s rise to any of these surface food sources can be exciting and adrenaline inducing. This is especially true when casting terrestrials. The terrestrial “take” is often loud, splashy and very violent. This is largely because terrestrials are typically larger than mayflies or caddis and offer a much higher concentration of calories and protein than a mayfly or caddis for an equivalent amount of effort. These factors alone make this technique well worth the effort even though feeding on the surface only accounts for about 15% of a trout’s total feeding activity. During an active hatch this technique will also out-produce nymph fishing because a nymph tumbling along the stream bottom will often go unnoticed by a trout feeding on surface insects, further up in the water column. The other 85% of the time, when trout aren’t feeding on the surface, they’re feeding below the surface on mayfly, caddis and stonefly nymphs. Since bugs at this stage in their life-cycle constitute 85% of a trout’s feeding activity, nymph fishing is the most effective way to catch trout a majority of the time. 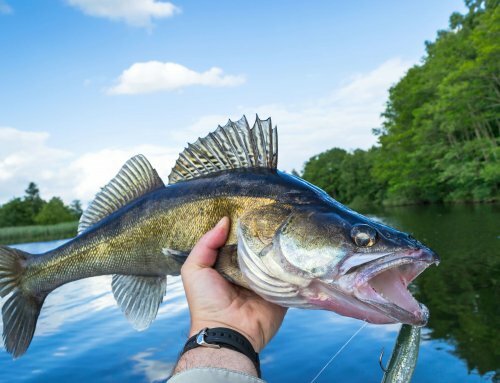 As these types of flies are fished below the water’s surface, a strike indicator that floats on top of the water is often used to detect bites. The only problem with using an indicator is that sometimes, especially on the narrow, crystal clear spring streams of Northeast Iowa, the indicator will spook the trout. As I mentioned before, a hopper dropper rig eliminates most of the disadvantages of the two techniques, and combines all of the advantages. This rig puts a terrestrial on the surface of the water for those surface-feeding fish, and because terrestrials represent a lot of bang for a trout’s feeding buck, even trout that are selectively feeding on an active hatch will often hit the terrestrial as well. The terrestrial on the surface will also serve as a strike indicator for any fish that eat the nymph that is drifting below it, and since these terrestrials are very natural to the trout, it is much less likely to spook them like a standard strike indicator would. While the terrestrial is taking care of the 15% feeding on the top, the nymph drifting below will take trout that are feeding below the surface. Because of the 85/15 division a majority of your fish will come on the nymph, and the hopper on the surface will pick up the bonus fish. 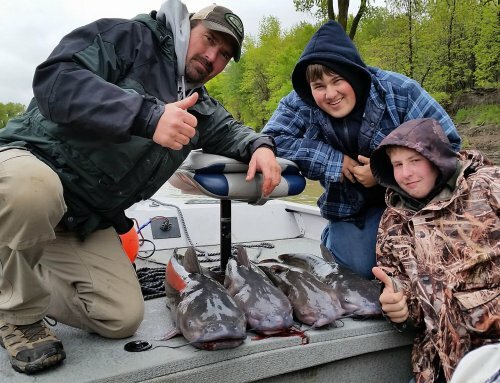 Because the hopper does represent such a rich food source, the fish that eat the hopper will often be bigger fish and your odds of catching a true trophy will increase. My favorite terrestrial to use in the hopper dropper rig, as the name suggests, is a grass hopper pattern. I prefer a foam hopper over versions tied out of hair because the foam hopper does not absorb water and floats high all day without any need to dry and will support even my heaviest stonefly nymphs when a hair hopper often will not. Also, because most of the real grasshoppers in my area are green, I opt for a hopper with an olive colored body. To help ensure maximum buoyancy and make it easier for my aging eyes to see my hopper on the water, I try to use #6 and #8 hoppers. I tend to upsize my leader when casting a hopper dropper combo, going with something like a 2X or 3X. Since the foam hopper is a fairly big fly with considerable air resistance, the heavier leader just helps it turn over on the cast a little better. The nymphs I use run the entire gambit, ranging from a size 24 Zebra Midge to a size 6 Stonefly Nymph. I typically just work my way through my nymph box until I find one that they are hitting particularly well that day. Once you have the hopper and the dropper selected, it’s time to assemble the rig. To save time on the stream, I actually assemble several rigs before I hit the stream and keep them in my vest in a box specifically designed to store hopper dropper rigs. The hopper is first tied to the tippet end of the leader with your favorite knot (improved clinch knot for me). Based on the size of dropper (nymph) I choose to use, I next select the appropriate sized tippet from my dispenser and tie one end to the bend of the hook on the hopper with another improved clinch knot. I then pull enough of the selected tippet from the dispenser to ensure the nymph rides just above the bottom of the stream as it drifts. Once I cut the selected length of tippet from my dispenser, I simply tie the chosen nymph onto the freshly cut end with a third improved clinch knot and the rig is ready to fish. Now it’s as simple as roll casting the rig into the top end of your favorite pool and letting it drift downstream through trouty looking water. Pay special attention to cut banks and riffles. Trout hiding under cut banks will often pop out to grab your nymph and come on up to smash the hopper instead. 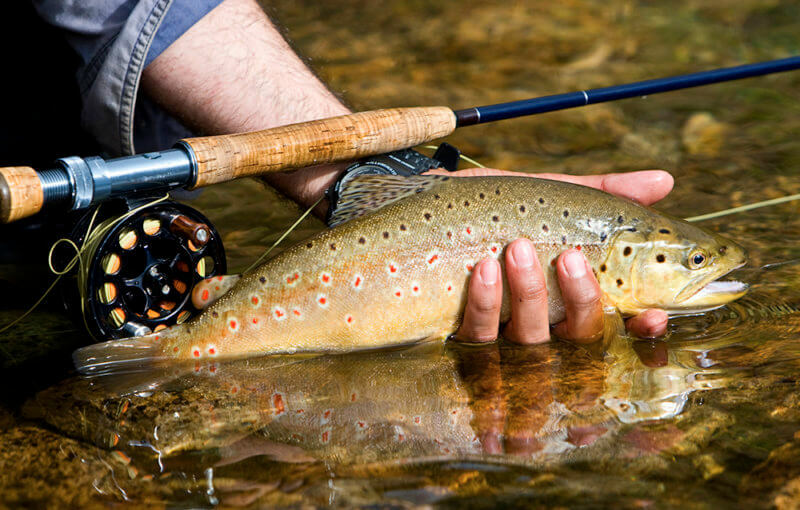 The hopper also floats high enough and is visible enough to fish even the frothiest of riffles for the trout that are hiding in the safety of its folds. 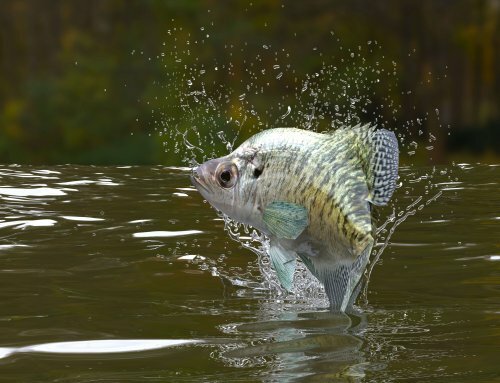 Sometimes trout will pull the hopper completely under, much like a bluegill pulling a bobber down, but other times the hopper will simply come to a sudden stop, twitch to one side or the other or make a small jump upstream. 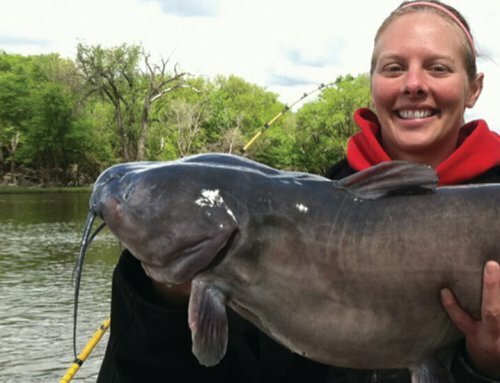 In any of these cases, a trout has probably just eaten your nymph and it’s time to set the hook. Be sure to keep your eyes on the hopper and be ready to set the hook at the slightest indication of any un-natural movement it might make. On those days where fish that are selectively feeding on an active hatch have no interest in my hopper, whatsoever, I will sometimes swap my hopper with a fairly large fly pattern that imitates whatever they are feeding on. This way I can still hook a few of those picky surface feeders, but also drift the depths with a nymph for other trout feeding beneath the surface. The hopper dropper just makes too much sense for you to not be using it. It simultaneously fishes both zones that trout feed in, it appeals to trout feeding selectively on the surface, and the odds that a true trophy will smash your hopper are very good. Even on days when the trout aren’t eating the hopper, and for all intents and purposes, I’m nymph fishing; I stick with the hopper just because I feel it is more natural than a strike indicator and won’t spook the fish below that are watching my nymph. You don’t need trout either to realize the full potential of this rig. It’s also a dynamite tactic for farm pond bluegills, so not living near a trout stream is no excuse for not giving this rig a try. Tie one up today and I can guarantee you that, just like me, it will soon become your favorite fly fishing rig!